Hi friends! 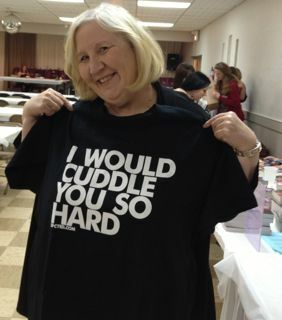 Barbara Vey spoke to Virginia Romance Writers last December and had some great wisdom to share about getting the most out of public romance events. Barbara blogs at Publisher’s Weekly and she thinks like a reader–a very smart reader. She goes to all kinds of romance events so she is an expert at connecting with readers both in person and online. What I like about her advice is that it’s easy to follow. 2) Readers love games and giveaways. If you’re at an event with romance readers then join in the fun. She noted that a highly successful author, Cathy Maxwell, is out there on the dance floor with readers, even at the end of a long day. 3) Reader’s love recommendations and discovering a new author. If you’re sitting next to a reader, start chatting with them about who they’re reading and offer your own suggestions. 4) Drop references to your hobbies, pets, or other interests–the reader next to you may share these interests too. Barbara always mentions the television shows she watches and her son. However, Barbara does not consider a romance event as just taking place in person. She sees an event as an opportunity to connect online–before, during, and after an event. Here’s her advice about how to prepare for an event online. 1) Do social media a lot. Announce the event you’re attending, and link to the event. a) Who is going to be at the event. b) What you will do at the event. c) Then after the event–blog about what was talked about. a)Find someone who’s blogging about the event. But what if you’re talking with other romance authors — highly successful, and busy romance authors? What do you talk about then–their latest book? I asked one highly successful romance writer about this. She said sure, you could ask them questions about that book, but she has probably finished that book so long ago, it’s a distant memory. She did point out that almost everyone is highly interested in what’s going on in the publishing world. The Random House merger for instance, or issues about Brand thieves…these are all things happening right now in the industry. Of course, I’m always fascinated to hear about another writer’s process–from doing research to final edits. Last but not least, there are those common interests you may share. Kids, pets, television shows, other romance writers—I once bonded with a major author about being vegetarian. By the end of the conversation it felt like we had really connected and we both were beaming. Speaking of upcoming romance events–I hope to see you all at Love Fest–the romance panels at Virginia Festival of the Book in a week and a half. It should be fun. Last year some fans came twenty minutes early to get a seat. I talked to one and told her the romance authors were off meeting with VRW members. She said “I know, the author is tweeting about it,” and flashed her smart phone at me. Doh! Next Terry McDermott DID IT! Fantastic post, Madeline. This is especially helpful leading up to RWA Nationals. Hi Madeline! Great blog. Loved meeting Barbara Vey at the VRW meeting and loved that you recapped all her advice here. Good stuff to remember. Mostly, it’s about that contact and making the most of every one. Thanks for the pointers and advice. Also thanks for everything you’re doing for the Love Fest. See you on 3/23!